Blog Quick Quotes: Holiday treat indulgences! RHONDA - My favorite holiday goodie is lefse. I am Norwegian in heritage and love this special treat during the holidays! It brings me back to special family times at my Grandparents with all of our extended family!!! ADORA - freshly baked Christmas cookies. Preheat oven to 350°. Combine cake mix and pumpkin spice in a large bowl. Add pumpkin puree and water, mix about 2 minutes. Fill cupcake liners 2/3 full and bake about 20 - 25 minutes, or until a toothpick inserted comes out clean. These are so easy and delicious. 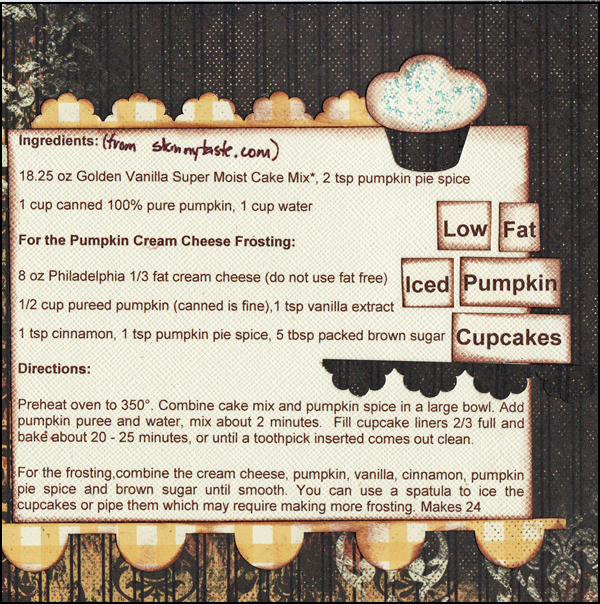 For my recipe page I used Quick Quotes Cherry Truffle collection: 100 and Mocha Mama Powder Puff chalk ink. I cut the cupcake on my Silhouette and added some stickles to the cupcake top.